Roadmap for milestones, developments, changes and products. No doubt about it, buzzwords like blockchain or cryptocurrency are creating a lot of headlines these days. The new-age technology is on it’s way to being widely adopted due to the incredible security, decentralized nature and the complete transparency features ingrained in the blockchain architecture. DECENT, a blockchain company looking to pioneer the space with their own proprietary technology called DCore, just released their roadmap for 2018. The company takes pride in the fact that they listen to their growing fan base and supportive community, utilizing feedback as they continually seek to build the best possible platform. The following roadmap is full of new developments, new products, refocused projects, and website overhauls and gives their supporters a good idea of where the company is headed. Improved documentation discussing more use cases, how to take advantage of DCore Blockchain, functional examples for various use cases like uploading, purchasing, creating and using Custom Tokens, creating and importing accounts and more. Guides on how to become a miner or seeder as well as detailed guidance on how to install a development interface to work with the DCore Platform. Toolkit, documentation and code samples for developing applications on Android platforms. Able to view, send and receive DCT based Custom Tokens. Enhanced DCT wallet with more security options. Ultimate entry point for new visitors to DECENT, returning DECENT experts, miners, seeders, future employees and the crypto-community. Basically, for everyone that is looking for comprehensive information about the DECENT ecosystem. Do you want to build your own application on DCore Blockchain? This is the place for you! Visitors will be able to download SDKs, learn how to use API and ultimately find information on how take ideas to another level with DCore Blockchain. Toolkit, documentation and code samples for developing applications on iOS platforms. Mobile wallet for Android platform. Full management of accounts including Custom Tokens. Mobile wallet for full management of accounts including User Issued Assets on iOS platform. Improved version of DCore Blockchain Explorer including real time blockchain setup, statistics, list of accounts, miners’ statistics and more. 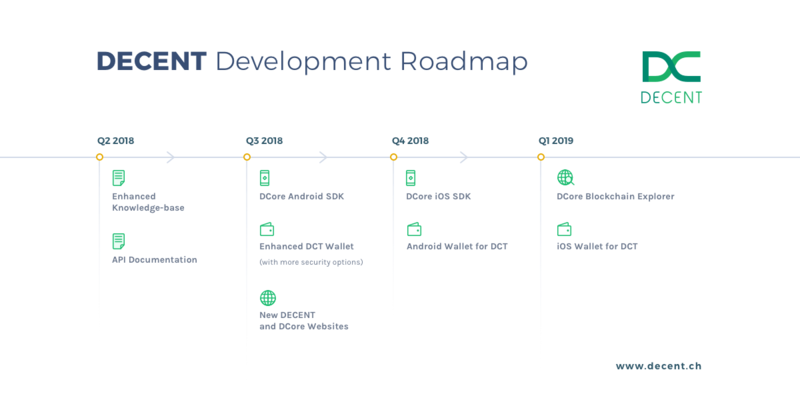 As you can see from the roadmap, the highest priorities for DECENT are to make DCore easier to implement and improve the infrastructure surrounding DCore and DCT. Throughout the coming months DECENT will be conducting usability surveys and meeting with users and 3rd party developers to be sure that DCore is easy to access and implement for all. The platform itself is open source, meaning anyone interested in building a blockchain based app (or dapp) can use DCore technology to get a crucial head start. There you have it, the DECENT roadmap for 2018 (plus a small bonus preview of Q1, 2019). DECENT was established in 2015, by Matej Michalko and Matej Boda. A Swiss company, DECENT is focused on using the power of blockchain to take on some of the biggest issues of our digital age. At the heart of DECENT is DCore, a proprietary platform based on blockchain technology. DCore and deep understanding of blockchains allows DECENT to collaborate with a number of industries, from business systems to game distributors and more. DCT or Digital Content Token is an essential element of DECENT. This purpose-built crypto-token runs on a Delegated Proof of Stake algorithm which allows for safe efficient trading. DCT is the primary currency for publishing or purchasing any content from applications built on DCore. Additionally, DCT funds the miners and seeders that maintain the network.